Citi Bike’s electric fleet will grow from just 200 to 4,000 pedal-assist bikes by the end of spring as part of a major expansion of — and a price increase on — the bike-share system’s most-popular vehicles, the company said on Thursday. Riders will pay $2 per ride for the electronic boost, meaning that a single-trip e-ride will rise to $5, starting today. Annual members, who pay $169, will also be charged the $2 e-bike fee, starting on April 27. NYCHA residents and SNAP recipients, who pay $60 per year, will pay 50 cents per e-ride, also starting on that date. The fees do not apply if, for some reason, the only bike in a dock is an electric one. The additional cost is necessary because swapping out batteries is labor-intensive, said Julie Wood, a spokeswoman for Citi Bike, which will hire “dozens” of new union workers to handle the challenge. Wood added that the company will ask its 150,000-plus members if the company should create a new annual plan that would include unlimited e-bike use, albeit for a higher fee. The company released statistics to back up that claim. Each electric Citi Bike, for example, gets ridden roughly 15 times per day, compared to five times per day for the standard bike (which Citi Bike is now officially calling “classic”). 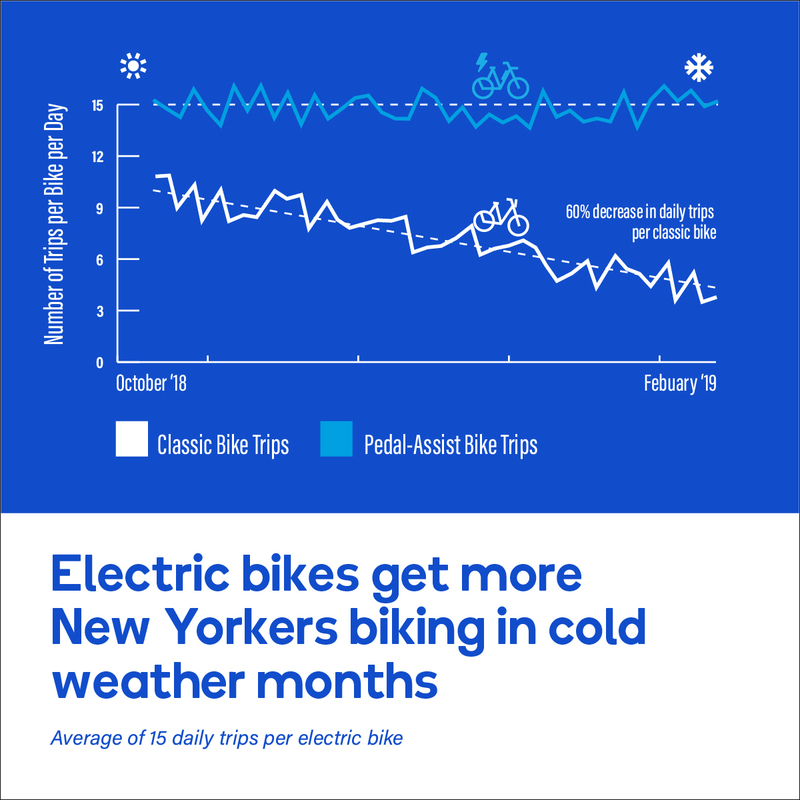 E-bike ridership does not decline during the winter. And the distances traveled by e-Citi Bikes are far greater, with roughly 18 percent of e-bike trips greater than three miles, versus just 10.7 percent of classic Citi Bike trips going that long. Currently, about 10 percent of Citi Bike trips across an East River bridge are done on the pedal-assist bikes, compared to about 5 percent. That number will likely grow considerably once Citi Bike expands its fleet beyond much of Manhattan and a narrow swath of western Queens and Brownstone Brooklyn. Residents of Jackson Heights, Corona, the Bronx, Sunset Park and Bushwick would certainly use electric Citi Bikes if they were available. The company announced in November that it will expand its overall fleet to 40,000 bikes over the next five years, but it has not revealed the lucky neighborhoods that will comprise the first phase of that expansion. The existing 200 battery-powered pedal-assist bikes have proven to be popular — when riders can find them. 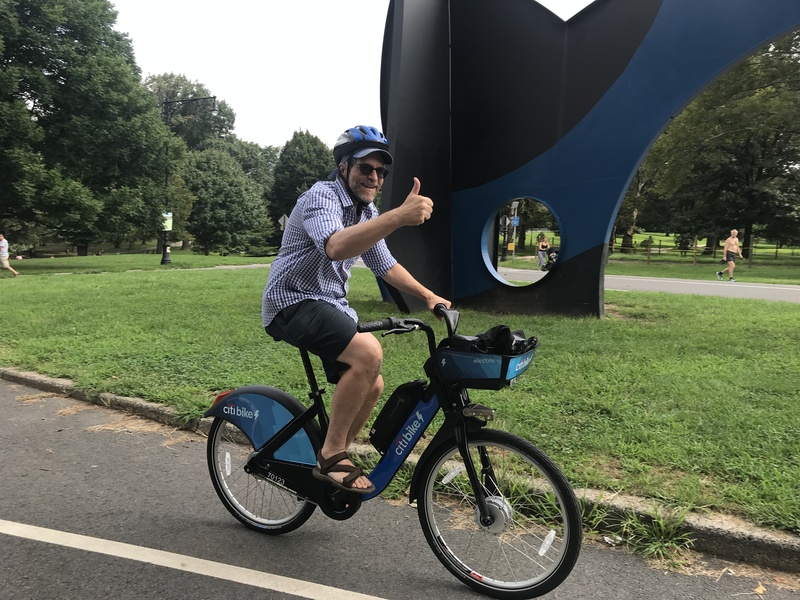 Urban planner and annual Citi Bike key-holder Mike Lydon has used one of the electric bikes just once and was impressed. He thinks the $2 fee will create different types of Citi Bike users. That Dickensian “Tale of Two E-Bikes” is actually in keeping with the philosophy at Citi Bike, currently owned by Lyft, which explained the company’s larger goal of replacing more car trips with e-bikes in a Medium post today. “Because pedal-assist bikes can be used more easily for longer, steeper trips, they are more likely to replace car trips, combating congestion, reducing pollution, and making the city more livable,” the company said in a statement. Many riders complain that Citi Bike has not completely perfected fleet balancing, and the addition of 4,000 new bikes could complicate matters. Will Citi Bike hire enough workers? Some annual members will likely balk at paying $2 more for an electric bike, especially members who pay $169 per year, but only ride occasionally. Will e-bike ridership actually decline as a result of the fee? It is unclear how much a “Citi Bike-Plus” membership will cost. Will members resist new fees — even for unlimited use of electric bikes — if the cost is seen as too high? When will the solar-powered Citi Bike docks themselves be able to re-charge spent batteries? She also said that having more e-bikes might make the company more efficient at replacing batteries and keep e-bikes on the road. They are adding 2,500 docks, which supports 1,000 new bikes (you need more docks than bikes so people can find an empty one). That means 3,000 e-bikes will come at the expense of “classic” bikes. They have been talking about e-bikes for over a year. They’ve taken exactly zero steps to add charging capacity. They should have picked their 20 most popular stations and hooked them up to the grid to support charging, at the very least. Wait youre trying to compare to Paris? They charge a $113 annual fee and that gets you unlimited 30-minute ebike rides. What are you talking about? And a single ride (no annual fee) is 2 euros for an ebike…Citibike is charging $5! It is a bait and switch. They sold memberships with the promise that 4,000 e-bikes were coming in March/April. Now theyre here with a fee that was never previously disclosed. Ours is way more expensive. 500% more for an annual membership. but our ebike upcharge is only about 50% more. i’m way more upset about our annual membership being so expensive than I am about ebike upcharges. Illogical argument. If the issue is with the company and fair pricing, then subsidizing a for-profit company with public dollars is simply placing the burden on everyone. The City should open up competition and allow Jump or others to operate in the city and allow the market to decide. Me neither. They’re by work, but trains are easy to and from manhattan when I don’t ride. ah. Okay. Thanks for the numbers. I see that as a big problem, too. you get extra time for taking from a full dock or returning to an empty dock. we basically should just have paris’ system. The bait-and-switch is selling me access to their network, and then the racks always being empty (when I need a bike) or full (when I need a dock). I bought my annual membership when I moved here last March, and after trying to make the Citibike commute work for a few weeks I abandoned it for just using my own bike. I’ve probably commuted via Citibike no more than a total of 40 days over the last year. Looking at their site right now, it seems that the V-decouverte is 5 euros for 1 bike, 10 Euros for 2, and 15 euros for 3, 4 or 5 velib’. MBA’s not what they used to be evidently. I posted this in the Facebook comments freakout. I hadn’t read this article, and no, I’m not a Citi Bike shill. I don’t see how it’s possible to add a much more expensive component to the system, and charge the same price. I don’t need an ebike very often, so I don’t know that I want the price of membership for everyone to go up; I might be happier paying for ebikes a la carte. From the article: “Will e-bike ridership actually decline as a result of the fee?” I think that’s kind of the point. Should an express A train cost more than a local E? a local E doesn’t require you to push it the whole way. Wow youre right, they must have changed it again. Thats very disappointing. Note that if you buy a Citibike Day pas ($12) you also only get 30 minutes, not 45. 1.90 was a stupidly good deal. and 5 ain’t exactly bad. Yep, I’m on this page here too. you keep repeating this like it is clever and insightful. Oh a different type of transportation run by different organizations costs other amounts so that’s just like Citibike. Are you familiar with NYC at all? Plucking out differences is how you get to do price discrimination. Does the service cost more to provide at rush hour than overnight? Or are the higher prices a way to suppress and redistribute demand? In theory, great. But theft, bike not allowed at work, in and out of the apt., etc. This is what citibike is for. Also you citibike fees need only be $169 annually, less than the cost of two years of your used, soon-to-be-stripped/stolen Trek. I wish it could work your way, too. They’ll be available–they’re money makers. They won’t be buying anymore old-style citibikes. motorized versus non-motorized is not “plucking” especially given the massive discrepancy in the amount of labor required to keep the two operational. LIRR and Subway are all in the MTA. there was aa brief ebike pilot. Motivate should offer a few free e-bike rides per year to annual members. that would do A LOT to ameliorate the reaction here. Alternatively, if they were able to get ConEd service to some high-volume stations, would that provide sufficient current to charge the batteries? While i am ok with a surcharge for the ebikes because of the added value, i do believe $2 is a way too steep. A 50 cent surcharge would have sufficed. I also believe this will bring ridership of the ebikes down. I will personally avoid them as of April 27th. I am a daily rider. Council Member Antonio Reynoso wonders why the Lyft-owned bike share system must charge more for pedal-assist bikes.